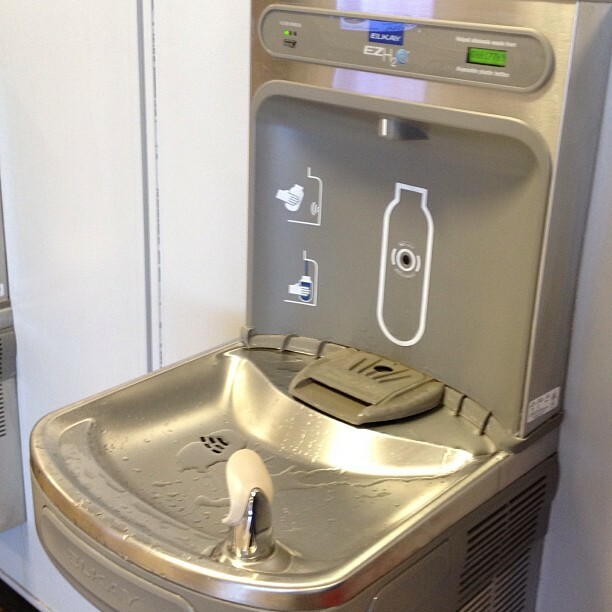 We recently saw and used these fantastic bottle filling drinking fountains at Salt Lake City International Airport. Freaking brilliant! No need to only fill your water bottle 1/2 way because it’s at a diagonal! Set the water bottle in the designated area and a sensor takes care of the rest. Ours happened to be post security, perfect for refilling an empty reusable nalgene/sigg or even to get more use out of a recyclable plastic bottle. The fountain even shows how many people have used it, thus translating into how much waste was avoided. I can’t wait to see more of these everywhere! Have you come across one? Where? and what did you think? We have one of these at school and it’s AMAZING! The little screen on the top right also counts how many water bottles were saved by refilling your own.